Written by: Ceil Roeger, O.P. with contributions from Sr. Eleanor Cresap, O.P. and Sr. Anna Marie Flusche, O.P. In August several very large wooden boxes arrived at the St. Dominic Villa. They contained a virtual pipe organ from Martin Digital Organs in California as a gift from Father John Kellick. Within days workers arrived and met with Sister Anna Marie Flusche to uncrate, set up and voice (sound adapt) it for our chapel. dedication of the organ. He gave a brief history of the organ itself and an explanation of a virtual pipe organ. Though the organ has an ancient history dating back to pre-Christian times, most of us are familiar with organ music which enhances our liturgies. One of the oldest playable organs in the world is in a church in Sion, Switzerland built in the 1400s. Members of religious orders engaged in building organs. Had it not been for their involvement, pipe organs probably would not have been adopted by the church. One of the most stunning organs in all of France was built in the 1700s by a Dominican lay brother, Jean-Esprit Isnard. There was no electricity to run the early instruments and it took two people to play the organ—one to play and one to pump the air. With the advent of electricity, the organ entered a different era. Pumpers were no longer needed. Eventually builders experimented with producing the sounds electronically, an endeavor that was never wholly successful. Enter the digital age. Technology has evolved so that a virtual pipe organ can be produced. 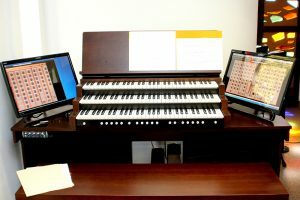 Thanks to the computer, it is now possible to record every pipe of the organ and reproduce the sounds electronically . . . the result is a virtual pipe organ. This way the sounds of the best organs in the world can be recorded and reproduced in a very small space. Sounds of Dutch and English organs are recorded for the organ donated by Father Kellick. Following the blessing, Sister Anna Marie performed two pieces to demonstrate the lush tones of the pipes. Sisters and friends joined in singing “Joyful, Joyful We Adore You” as she played. The postlude was an arrangement of “Now Thank We All Our God” by David Cherwein. 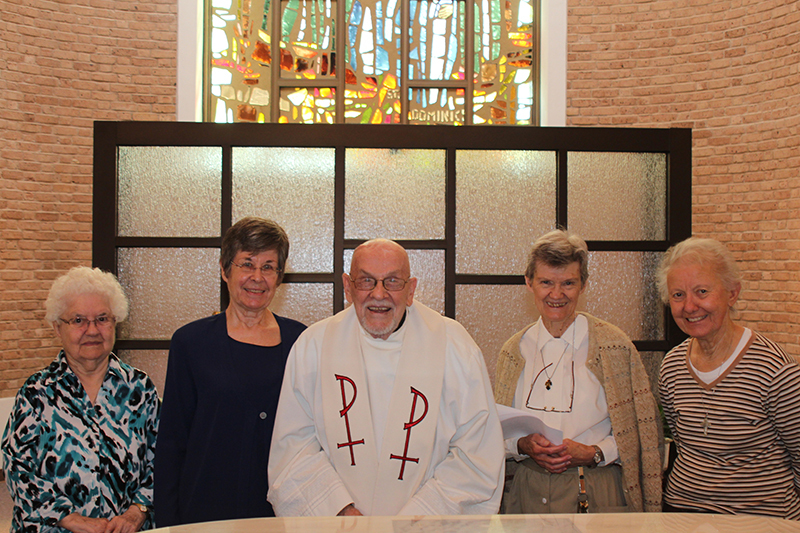 Thanks to this fantastic gift from Father Kellick the liturgies in the Villa Chapel will be enhanced for many years.